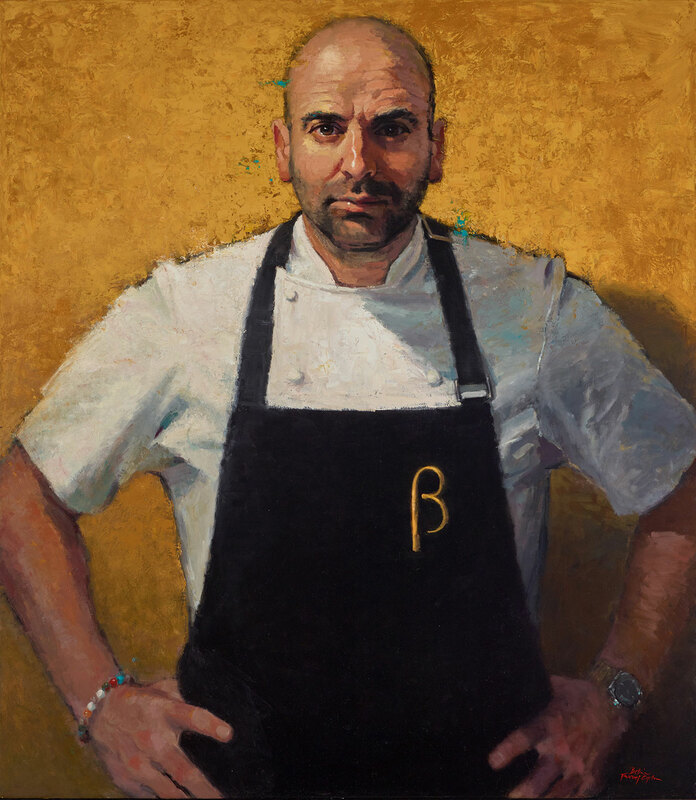 George Calombaris, the Masterchef judge most likely to boom boom shake the room, is the subject of this year’s Archibald Packing Room prize-winning portrait by Melbourne artist Betina Fauvel-Ogden. Fauvel-Ogden, a first time entrant in the prestigious competition, painted her portrait of the acclaimed culinary figure over the course of three sittings, during which time she “focused on capturing the determination in his eyes”. Pictured in a pose “George felt most comfortable with”, Calombaris – in full chef’s regalia – is set against what’s best described as a ‘negative space’ inspired by the colour of the restauranteur’s cookbook, Greek. Viewers of Masterchef will no doubt be familiar with all these ‘signature’ Calombaris ‘elements’ – his eyes in particular being ‘the hero’ of his spectacular ‘food journey’ (amongst any other number of hackneyed Masterchef clichés). Unlike winners of the show who take home a lifetime worth of tears spilt over poorly tempered chocolate and half-baked tuiles, Fauvel-Ogden is the recipient of a cash prize worth $1500 and the knowledge that the gallery staff who receive, unpack and hang each portrait would go in for seconds every time. Finalists for the Archibald, Wynne and Sulman Prizes were announced today, and winners will be announced next Friday. You can view them online here or in situ at the Art Gallery of New South Wales from July 16.